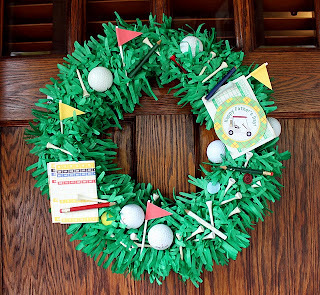 Crossing the Bugger-Dixon Line shared how to make this AMAZING Golf Wreath for Father's Day. Isn't it amazing? What a great wreath this would make for a golf party...or what about a Graduation wreath for a high school golfer? Or maybe a retirement party? So awesome. I wonder if you could even change the golf items out and put in items for other sports? Or maybe flowers for a spring wreath? What a great idea! Munchkin Munchies shared these awesome Corn Dog Cookies. Don't they look so cool? These would be perfect to serve at a backyard BBQ picnic or summer party. They look so real and fun. You can't help but not to want one...or two... or more. And as easy as they are to make, you can make that many too. 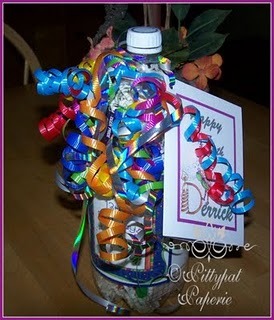 Pittypat Papperie shared a fun Soda Bottle gift container. Have you ever tried to find a way to wrap that unique sized gift? Or tried to find a fun way to give your gift? How great would it be to receive it in a up-cycled bottle with some serious "bling" to it? So fun and original! The recipient will LOVE it! 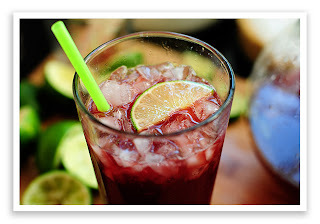 She Wears Many Hats shared this recipe for Cherry Limeade. I don't like soda. I don't like carbonation, but I do love a good Sonic Cherry Limeade every now and then. And I think my hubby could drink one every day of the year...and twice on Saturdays if I'd let him. Fortunately our Sonic is WAY across town, but I think if I can find some of the Cherry juice listed in the ingredients...I may just have one of these waiting for him when he comes home from work. And wouldn't it be great to have this at a summer cookout? Yummy! Come Together Kids shared her PVC Pipe Sprinkler. I LOVE this idea! If you've read my blog at all, you know I love to make things out of PVC pipe (that's what I use in my backdrops and photobooth backgrounds)...so I love how easy and perfect this is for a sprinkler system. I actually can't believe I didn't think of it! "Mini Me" wants to have an ice cream and water party for his bday next month, so I love that I could make this and add it to my 'water wonderland'.